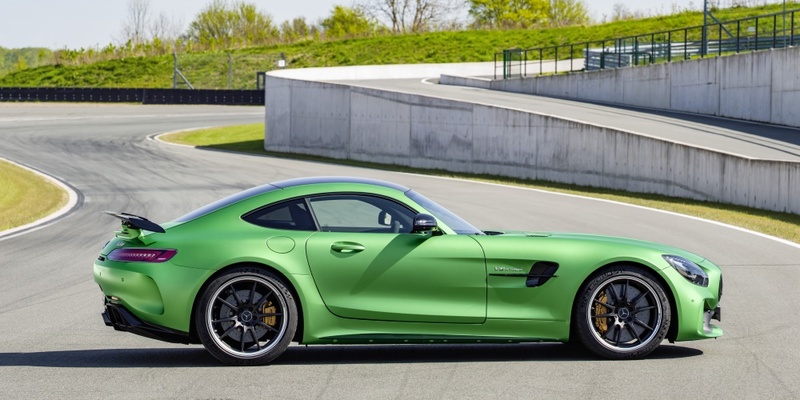 Mercedes-AMG continues to grow and is expanding the top end of its product range with the introduction of the new AMG GT R.
From the world's most demanding racetrack directly onto the road: Never before has Mercedes-AMG packed so much motorsport technology into a production vehicle than into the new AMG GT R. The front-mid-engine concept with transaxle, the twin-turbo V8 engine rated at 430 kW/585 hp, the extensively modified suspension, the new aerodynamics and the intelligent lightweight construction lay the foundations for an especially dynamic driving experience. 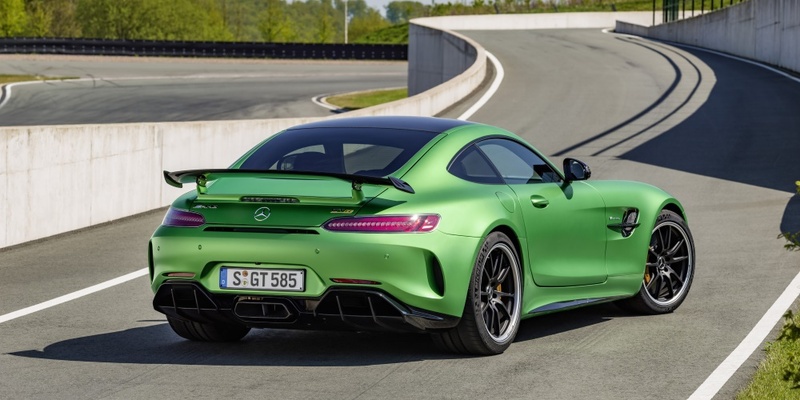 Even from afar, the exclusive "AMG green hell magno" special paintwork leaves no doubt as to the sports car's origin, having spent most of its development time in the "Green Hell" of the Nurburgring racetrack. Wider front and rear wings allow an increased track width for optimum grip and even higher cornering speeds. The new front fascia with active elements, the large rear aerofoil and the new rear fascia with double diffuser enhance aerodynamic efficiency and help ensure optimum grip. The lightweight forged wheels shod with cup tyres as standard are likewise designed for maximum driving dynamics. The same applies to other new features such as the active rear-wheel steering, the nine-way adjustable traction control system and the adjustable coil-over suspension with additional electronic control. What is more, the new AMG Panamericana grille emphasises the unique standing of the AMG GT R. Its characteristic form with vertical fins celebrated its world premiere on the Mercedes-AMG GT3 customer-sport racing car and now for the first time features on an AMG production vehicle. "Our sports-car and performance brand AMG has its roots in motorsport and, ever since its formation, has repeatedly faced up to the competition on the racetrack. 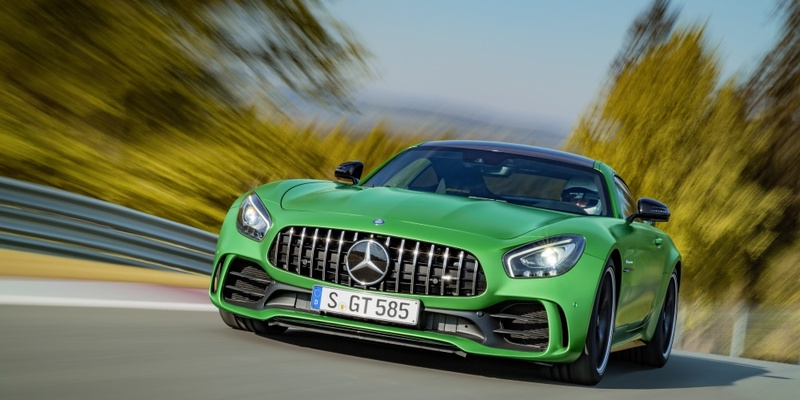 These genes are particularly prevalent in the new AMG GT R. Boasting a wealth of technological innovations, the new top-of-the-range model is proof of the close collaboration between our constructors of racing cars and road-going vehicles," states Professor Thomas Weber, Member of the Board of Management of Daimler AG, responsible for Group Research and Mercedes-Benz Cars Development. The third member of the AMG GT family is the new spearhead of the AMG model range. Featuring pioneering technologies, the AMG GT R was designed with racetrack use firmly in mind. Its development was largely based on vast motor-racing experience in AMG GT3 customer sport and the German Touring Car Masters. Figures such as 3.6 seconds from zero to 100 km/h and a top speed of 318 km/h, combined with the outstanding driving dynamics, will undoubtedly translate into extremely fast laps on the racetrack. The concept with front mid-engine and transmission in transaxle configuration on the rear axle, a tried-and-tested feature of the AMG GT and AMG GT S, makes for a beneficial rear-biased weight distribution of 47.3 to 52.7. In conjunction with the vehicle's low centre of gravity, this translates into extremely agile handling and permits high cornering speeds. 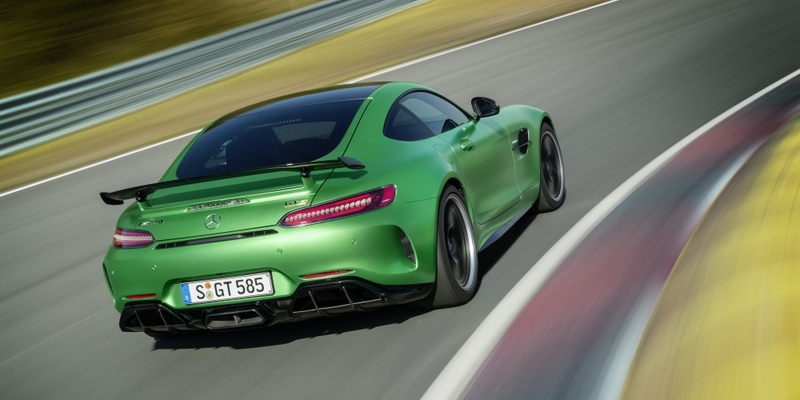 With a power-to-weight ratio of 2.66 kilograms per hp, the Mercedes-AMG GT R takes up pole position in its segment. 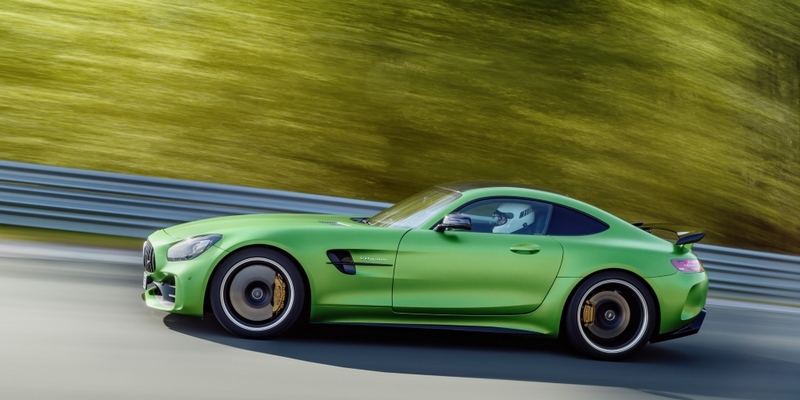 "With the new AMG GT R, we have reached the next level of driving performance. This road-going sports car with motor-racing genes and innovative technical solutions offers an ultimate driving experience that allows people to feel our motorsport origins in every fibre. It combines the driving dynamics of our AMG GT3 racing car with the everyday practicality of the AMG GT. Those with petrol in their veins will be thrilled by the radical longitudinal and lateral acceleration, the precise turn-in, and the sensational grip. We have modified all performance-relevant components and linked them together intelligently for maximum driving dynamics," says Tobias Moers, CEO of Mercedes-AMG GmbH. 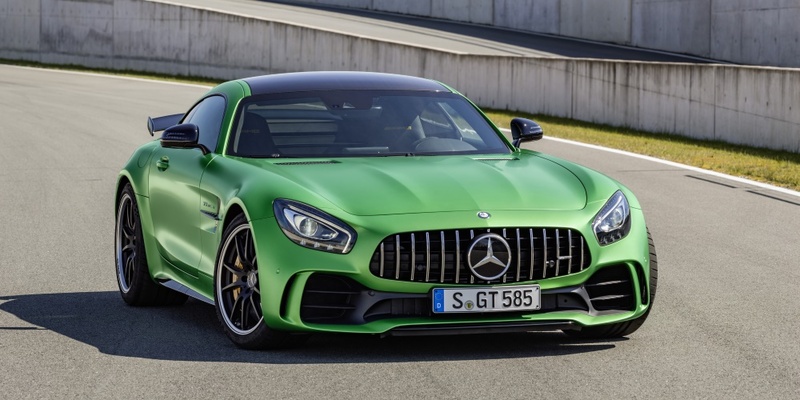 The heart of the new high-performance athlete is pumping stronger than ever: the AMG 4.0-litre twin-turbo engine in the AMG GT R has an output of 430 kW (585 hp), which is 55 kW (75 hp) more than the previous top-of-the-range engine in the GT S. The peak torque of 700 Nm is available between 1900 and 5500 rpm. 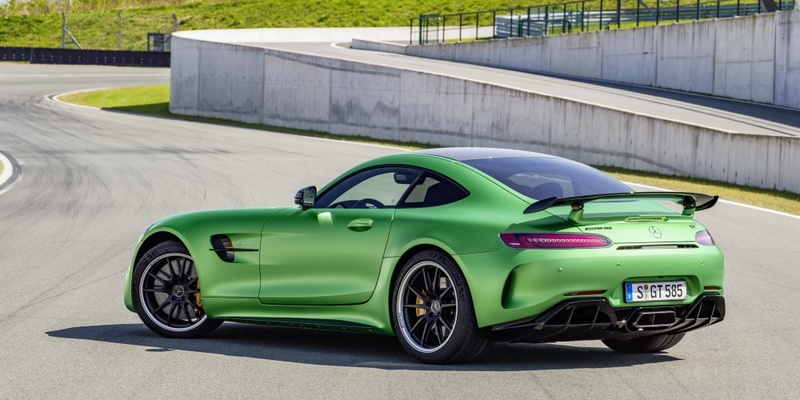 The design of the AMG GT R embodies sensuous clarity - hot & cool. Apart from the powerfully sculpted body and the motorsport components, the new AMG Panamericana grille is a real eye-catcher. This unique feature also comes from the world of motorsport and is celebrating its standard-production premiere in the AMG GT R: Its 15 chrome-plated vertical fins cite the look of the new AMG GT3 racing car. The basic form of the new radiator grille goes back to the Mercedes-Benz 300 SL racing car that won the legendary Panamericana road race in Mexico in 1952.